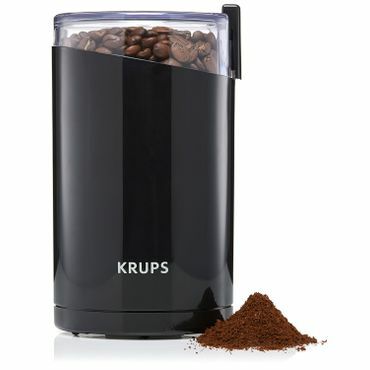 The simple-to-use Krups F203 Electric Spice and Coffee Grinder gets top ratings from experts and owners as a great, basic blade grinder that more than delivers on performance for its price. Reviewers say that the blades are sharp and the motor is strong. Many owners add that their Krups grinder is still cranking along after many years of use. 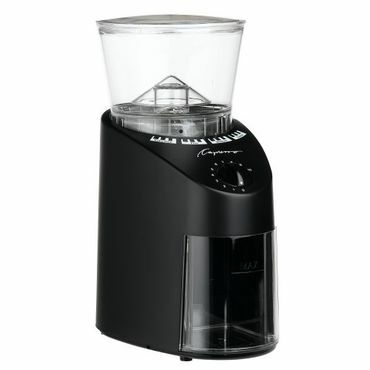 This Krups grinder is also versatile; many use it for grinding other items like spices, nuts and seeds. If you want a commercial-grade grinder at a price that won't make you feel like you need to open a coffee shop to recoup your costs, look no further than the Baratza Virtuoso Conical Burr Coffee Grinder. It's a durable, consistent burr coffee grinder featuring 40 grind adjustments from 250 to 1200 microns. This makes it suitable for a wide range of specialty grinds. The Virtuoso is also reported as easy and intuitive to use and is built to last. The Capresso 560.01 Infinity is a conical burr grinder that grinds as consistently as more expensive models, but at a fraction of the price. With 16 settings, it grinds for espresso, drip coffee and French press, and owners say its slow motor preserves flavor. Some say that the results are not as satisfactory as with higher-end grinders, but most are very happy with it. Feedback indicates that the Capresso Infinity is quiet, attractive and durable. There are plenty of coffee enthusiasts who like what they call the almost "meditative" process of manually grinding their beans. 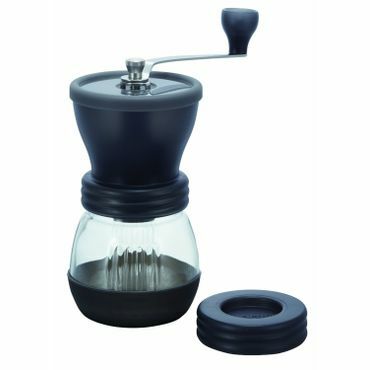 For them, the Hario Skerton Ceramic Coffee Mill is a great choice, say experts and owners. The Hario does an excellent job on a variety of grinds, from fine to coarse, and earns particular raves from fans of French press and pour over coffee. It takes some muscle to use, however, so this grinder is not for the weak-armed. This is the most common type of grinder. Blade grinders chop beans with a spinning blade attached to a motor. These models are relatively cheap as far as countertop appliances go -- most cost less than $20. They tend to be simple, mostly plastic, push-button machines, although some have multiple settings. Blade grinders are also useful for other tasks such as grinding spices, seeds or nuts. If you do so, however, the grinder must be cleaned thoroughly between uses to avoid mixing flavors. Some users report keeping two inexpensive blade grinders handy: one for coffee and one for spices. Experts say if you are a serious coffee aficionado you'll want to invest in a burr coffee grinder. Burr grinders have two gears that slowly crush the beans into particles. Most have ceramic burrs, which are thought to stay sharper longer than burrs made from other materials. Ceramic burr grinders can come with either conical burrs or flat plate burrs. Some people don't like flat plate burrs, saying they can heat up too much, but most high-end grinders have technology to keep that from happening. Many experts say there is no difference in grind quality between the two types, so that is not a make-or-break consideration, just a difference in style. Coffee experts agree: A great cup of coffee stars with the grinder. You can have the highest-end coffee or espresso maker money can buy, but if you don't start with an even, fresh grind from high-quality beans, you may as well save your cash. In fact, CoffeeGeek.com has worked up a handy chart for how to plan your espresso maker/coffee grinder budget to get the optimal setup. In the preamble to that guide, Mark Prince notes, "I've often said that I can make a better shot of espresso with a $200 espresso machine and a $400 grinder than I can with a $2,000 espresso machine and no grinder (or a blade grinder)... and it's absolutely true." Burr grinders are more expensive than blade units, but most experts agree that the added expense is worth it to get the most precise grind -- a necessity for specialty coffees and brewing techniques like espresso, French press, pour-over, or Turkish. Many burr grinders have upscale metal construction, and they have a solid, weighty feel. Small, portable burr grinders start as low as $35 or so for a manual model, but can go up to $700 or more, depending on the number of settings, build quality and grind consistency. Many owners opting for the top-priced models say they expect their grinders to last a lifetime. However, plenty of people manage to soldier on with a less expensive or less high-end coffee grinder and are very satisfied with the resulting brew. And don't forget, you still need a good coffee maker as well. We cover coffee makers, single cup coffee makers and espresso machines in separate reports. Check them out to find the perfect pairing for your grinder. To determine our Best Reviewed coffee grinders, we analyzed expert and owner reviews as well as professional tests. Some are older tests and reviews, but are still valid because many of these coffee grinders are so durable and so popular that they have been around for many years without any significant changes. Just as important as the experts' experience is owner reviews. When it comes to coffee, there are some extremely knowledgeable amateurs out there who give excellent feedback. It's also interesting to see what newbies have to say when they take their brand-new grinder for a spin. If you're looking for a simple and dependable blade grinder, you can't go wrong with the Krups F203 Electric Spice and Coffee Grinder (Est. $20). It has tens of thousands of owner reviews at Amazon.com, as well as thousands more elsewhere, and the overwhelming majority of comments are very positive. Some of these reviews go back more than a decade, and many owners have come back to update their reviews to say their Krups grinder is still going strong 5, 10 or 12 years later, making this little grinder an amazing value. Its simple operation is another reason why owners love the Krups F203 grinder. Just push a button, they say, and it starts grinding; release the button to stop. You do need to check the consistency of the grind every now and again because the Krups doesn't have any presets for, say, coarse or fine grounds. However, users say the learning curve is very slight and you'll quickly develop an intuition for when you have the grind you desire. Most of the poor reviews we see, and there aren't many of those, are from people who bought this for specialty grinds, such as espresso. Blade grinders simply aren't suitable for that very fine and very even type of grind. The only other complaints we saw about the Krups was that it can be messy when removing the lid, with coffee (or other ground items) spilling out. Many say they have solved that problem by simply turning the unit upside down and tapping it against the counter to dislodge loose grinds before removing the lid. Many reviewers suggest it's easier to clean if you use a nylon brush to clear out the remaining contents. A few say that this grinder is noisy, but many more say it's quiet enough to use in the morning without waking those still sleeping, so, in this case, the decibel level seems to be in the ear of the beholder. 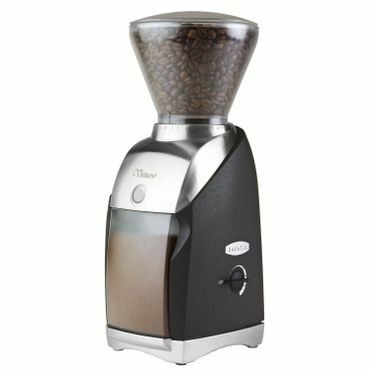 The Proctor Silex E160BY Fresh Grind Coffee Grinder (Est. $18) gets reviews that are almost as good as the Krups. The E160BY gets better feedback as a spice and seed grinder than a coffee grinder, however, and we see more durability complaints than for the Krups grinder. Still, most owners say it works great and is super simple to use. What the Proctor Silex grinder has that the Krups grinder does not is a retractable cord, and reviewers absolutely love that feature; they say it makes it very easy to store. Another top choice, with a larger capacity than either the Krups or the Proctor Silex grinders is the Capresso Cool Grind (Est. $20), which can hold enough beans for up to 15 cups of coffee. Owners say the Capresso Cool Grind does a good job of making a consistent grind, but note that it's hard to get the grounds out of the container dome after grinding. Still, like the Proctor Silex, the Capresso has built-in cord storage, which is very popular. It also features technology to keep heat from building up when grinding, something that coffee experts say can negatively affect the taste of your coffee. It does get good reviews overall from coffee drinkers, even a few who say it competes very well with their burr grinders. There's no doubt that the Krups F203 shines in this category due to the sheer weight of years and years of mostly positive user reviews, but if a place to put the cord for storing is a priority, both the Proctor Silex E160BY and the Capresso Cool Grind have those features; and the Capresso may be better suited for those who want to use a blade grinder as their exclusive coffee grinder.